This change suggests that children’s stereotypes linking science with men have weakened over time, said the researchers, consistent with more women becoming scientists and children’s media depicting more female scientists on television shows, magazines, and other media. The study, published in the journal Child Development, is the first systematic, quantitative review of the “Draw-A-Scientist” literature and combined results from 78 U.S. studies, including more than 20,000 children in kindergarten through 12th grade. In the first landmark study, conducted between 1966 and 1977, less than one percent of nearly 5,000 children drew an image resembling a woman when asked to draw a scientist. Their artwork almost exclusively depicted men working inside with laboratory equipment, often with lab coats, glasses, and facial hair. But in later studies (1985 to 2016), 28 percent of children drew a female scientist, on average. In addition, both girls and boys drew female scientists more often over time, though girls overall drew female scientists much more often than boys. The researchers also studied how children form stereotypes about scientists across child development. The results suggested children did not associate science with men until grade school; around age 5, they drew roughly equal percentages of male and female scientists. During elementary and middle school, the tendency to draw male scientists increased strongly with age. 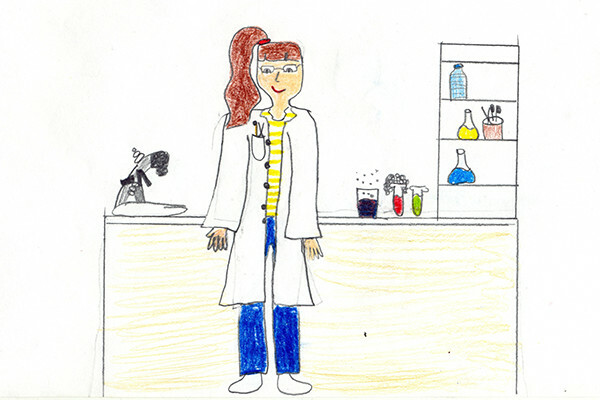 Older children were also more likely to draw scientists with lab coats and glasses, suggesting that children learn other stereotypes as they mature. “These changes across children’s age likely reflect that children’s exposure to male scientists accumulates during development, even in recent years,” said David Uttal, a co-author of the study and a professor of education and psychology in Northwestern’s School of Education and Social Policy and Weinberg College of Arts and Sciences. “To build on cultural changes, teachers and parents should present children with multiple examples of female and male scientists across many contexts such as science courses, television shows, and informal conversations,” Uttal said.